Up until I graduated college, I never really had a skincare routine. No joke I slept in my make up pretty much every night, usually not on purpose though, you know that college life. I have pretty normal to dry skin and rarely ever got any kind of acne. After graduation when I was actually making money and being a real human being, I figured it was time to start investing in my skin a little more. For the first year or so, that really only consisted of washing my face before bed and using a decent moisturizer. I went to my first ever dermatologist appointment when I started to get really bad acne on my forehead. I was given a topical and changed my brith control and all was cleared up. Somewhere between then and now my skin changed and I started to break out very often ( I think its stress) When Ryan and I got engaged, I decided I was going to drop a bunch of money and invest in really nice skincare products. I’m talking $200 3 oz serums and all the best most expensive beauty tools on the market. I was convinced I was going to have celebrity skin by the wedding. Well pretty much the opposite happened.My skin was breaking out so badly I would cry before work from the pain and struggle of trying to cover it up. It was mainly around my chin and forehead and they were mostly cystic pimples. I finally went to the dermatologist and he prescribed me a new topical called Aczone. He also told me that all that fancy stuff was likely the cause of the acne. He suggested using Cetaphil products. Within a few weeks my skin was almost completely clear. I still get small breakouts and my problem is that I’ve gotten in the habit of popping and picking my pimples so I still deal with some scaring and redness but my overall my skin is SO much better. Cleanser: I start by washing my face with warm water and Cetaphil cleanser. This usually gets most of my make up off. If i had eye make up on that day, I’ll end up with raccoon eyes but I’ll get to that later. Clarisonic: Next I put two more pumps of cleanser on my Clarisonic brush and go back over my face with that to deep cleanse the make up off my face. 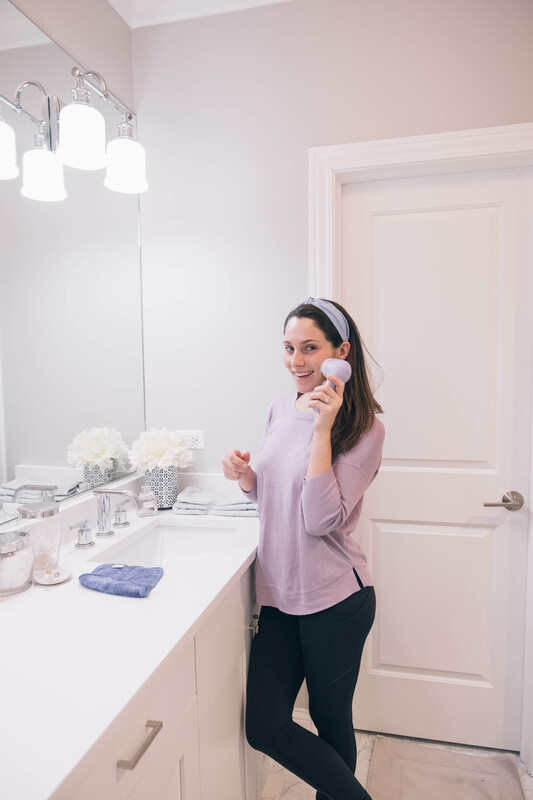 I use the Clarisonic cashmere brush which I’m obsessed with! It’s so much softer on my skin and I feel like it absorbs the dirt better. Make up removal cloth: I splash my face with warm water to clean off all the cleanser and then try it with this incredible make up removal cloth. That helps to get off anything I might have missed with my Clarisonic like those raccoon eyes. * These make up removal cloths are the best thing ever. I was shocked at how well they work but I haven’t used a make up wipe since I discovered them a year or tow ago. They have helped my skin so much! They take make up RIGHT off and are especially great for those weekend nights when you don’t want to do your entire skincare routine but just need to get your make up off! Aczone: After all my make up is off, I put Aczone topical serum on my forehead and chin. I suggest getting something like this from your dermatologist even if you just get a few breakouts every so often its nice to have for those problem areas! They should be able to suggest something that will work best for you skin. Cortizone 10: This stuff is my miracle and little skincare secret! You would never guess it but this stuff does WONDERS at reducing redness and clearing up any pimples I popped or picked recently. If I recently popped or messed with a pimple, I’ll smother a big dab of this on it. It doesn’t clear it up but it definitely helps reduce redness and keeps scabs or dryness from cracking at night. C&E Cream: This is the only pricey product I still use. C&E cream is filled with Vitamins C & E which minimize wrinkles and even skin tone. I just put a very small amount on this in areas where I have darker scaring from pimples I’ve picked. Moisturizer: Last but not least, I put two pumps of moisturizer in the palm of my hand and gently rub it into my skin. Always make sure you rub anything into your skin in an upward movement. You want to avoid pulling your skin down at all costs to prevent sagging! Cleanser: Similar to in the evening, I start by washing my face with warm water and Cetaphil cleanser. 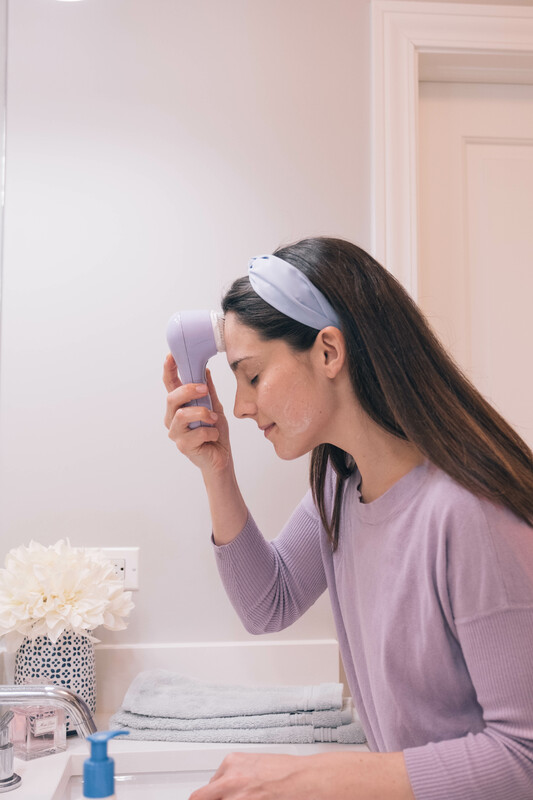 Clarisonic: Depending on how my skin is doing and how well I’ve done with my night time routine sometimes I’ll use my Clarisonic again but usually I only do that at night. Make up removal cloth: If I still have raccoon eyes I’ll use this again to clear up anything left around my eyes. Cortizone 10: Again, I only use this if I have a pimple, scab or redness but its even more beneficial in the morning before putting make up on. It really smoothes out the skin and makes it so much easier to cover up blemishes, dryness, scabs and all that fun stuff. Moisturizer: Again, the last step is to moisturize! I always make sure to use a moisturizer with SPF in it all year. While this is a pretty lengthy post its a very simple skincare routine and the better I get at sticking with it, the better I notice my skin getting so consistency is key. Also if you can learn anything from me, if your current skincare routine is working for you DON’T feel pressured to buy expensive products. If you think you need to revamp your skincare routine, I strongly suggest going to a dermatologist before making any changes. P.S. This is not sponsored in any way by any of these brands they are truly all the brands I use and love!